First published, with slight alterations, at the Film Experience. 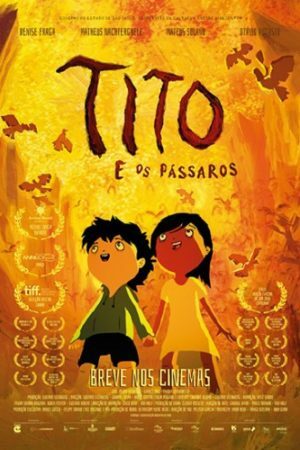 Presented now during the film's limited release in the U.S.
First things first: the Brazilian animated feature Tito and the Birds is a preposterously beautiful motion picture. The film's style is perhaps best described as looking like a digital oil painting, with swirling smears of color defining every background and character. It is not by any stretch of the imagination looking to present a realistic vision of the world; rather, it creates spaces defined only in outlines and crude shapes, and then filled in with dramatic swatches of barely-motivated reds and yellows and blues that function expressively and emotionally rather than to build out the narrative. It is, at an absolute minimum, one of the most eccentric, distinctive animated features created in 2019, but it's not just eccentric: the aesthetic is thoughtful, consistent, and pairs elegantly with the film's thematic concerns. Those concerns are pretty overt, to the point that it almost feels like the film is a bit of a diatribe. Tito fashions itself as something of a Young Person's Guide to Media Skepticism, using several traits of children's cinema (bright colors, 10-year-old protagonists who are social misfits, an idealised missing parent, talking animals of a sort) to package a plot about how easy it is for corporate news media to control and corrupt the inner lives of the everyday citizens who rely on that media. You can pick which modern-day companies and which modern-day governments they prop up that reminds you of, but the film doesn't need that level of specificity to function effectively as a commentary on life under capitalism. The sense of constant, twitchy motion is a perfect fit for the wiry nervousness of the plot and themes, while the clarity of the digital medium gives the simulacrum of expressionistic oil paintings a boldness and brightness that pairs well with the film's strong, angry response to the cruelty and avarice of its villains. Simple and obvious though it might be, Tito and the Birds is also striking and passionate, one of the most excitingly fresh features from an exceptionally strong year for animation.